Saint Clement of Ohrid (Kliment Ohridski, Климент Охридски) was the best student of Saints Cyril & Methodius, who continued and developed on with their work. 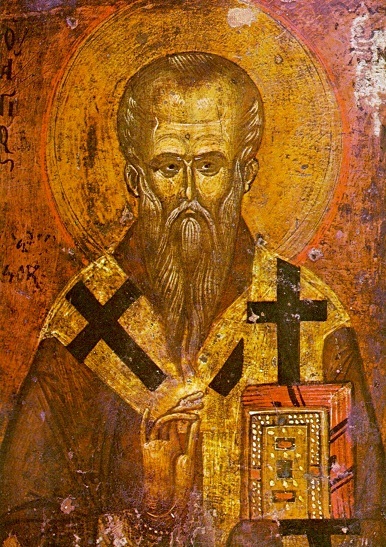 Saint Clement of Ohrid was founder of the Slavic literacy and Slavic culture in Macedonia and also, the founder of the first Slavic university in Ohrid. Saint Clement of Ohrid is the first Slavic writer. St. Clement of Ohrid was in the row of those students of St. Cyril and Methodius who helped them in the mission of Moravia all to Rome. After the mission in Rome, he helped St. Methodius in his work in Moravia and Panonia and later he helped him in defensive way against the attacks of the Latin-German priests. After the death of St. Methodius St. Clement, St. Naum, Angelarius and St. Sava were in a get a way position from Moravia. After a long period of torturing they arrived in Pliska. They were welcomed by the bulgarian comes. But the stay in Pliska wasn't long. As soon as possible St. Clement went in the area called Kutmičevica. The love he felt to the native country, made him to leave Pliska and to go in Macedonia. In Kutmičevica he stayed 7 years, from 886 to 893, as a teacher with duty of checking the church work. Here in the area of Kutmičevica, in Ohrid, St. Clement helped by his friend St. Naum established the first university of the Slavs and also of the Balkans, the Ohrid Literary School. The legend says around 3.000 students, who later became excellent teachers and priests. This success of St. Clement is - The First Slavic University. In the Ohrid literary school has been established rich school and literacy work. Himself, St. Clement has wrote around 50 arts, and also writer was and St. Naum. Their work was moved on later after their death by their students. One of the most important arts written in this school is "O Pismemeh" (on English - On Letters). 4. Offensive play against the Greek language and also against the Hellenization of the Slavic population. In 893 AD, bigger part of Macedonia went in the borders of Bulgaria, the Bulgarian comes Simeon called a meeting so the question of the church and the language to be solved. After the voting procedure the majority voted for main language in Bulgaria to be the Slavic. 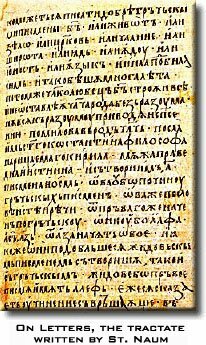 But because Simeon was afraid if takes the Slavic language as official that he may start an reaction at Byzantine he said, Clement would make some changes at the alphabet. But from the opposite side St. Clement wanted the work of St. Cyril and Methodius to stay as it was made, by them originally. Because of all this St. Clement got back in Ohrid to do his vise-episcope work, joined by his friend St. Naum, who took his teachers place. St. Clement moved on with his work to organized the church and to spread the the work of the Ohrid School. During his work he had several not pleasure events made by the episcope Gavril who was by nationality Greek. After a short period Saint Clement of Ohrid stopped working. Tired of the hard work that he has done during his life he died in Ohrid in 916 AD. Saint Clement of Ohrid was burried in the monastery St. Pantelejmon built by him, where he spent his last moments of his life.